I play guitar. 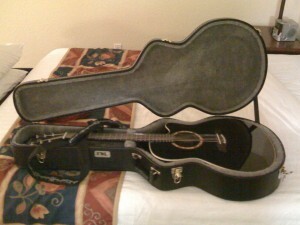 When I’m travelling I sometimes have to be devious to get my guitar fix. Luckily in the US the guitar stores let you try the guitars out and plug them in to amps. So I go to the Guitar Center in Santa Clara when I’m in Silicon Valley. 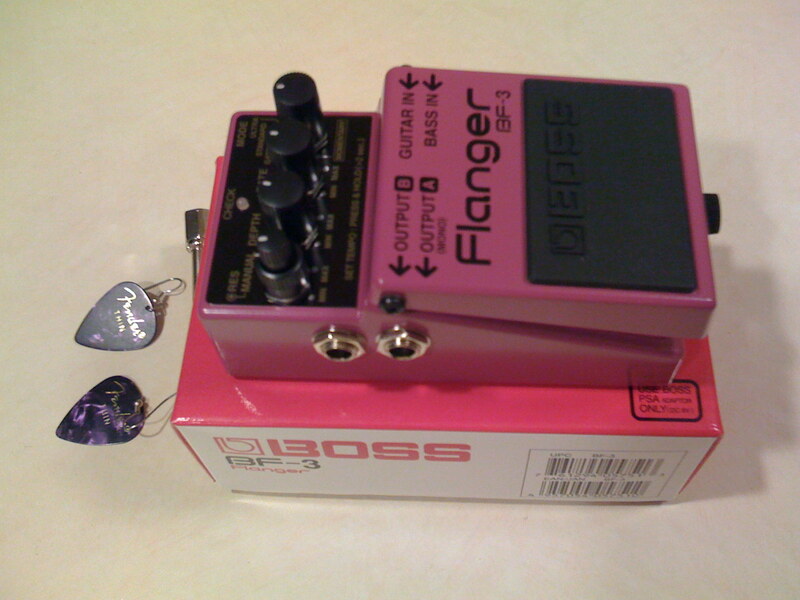 I don’t feel too guilty since I’ve bought a guitar from them and now two guitar pedals. Yes I went to play and came out having spent $150 on an Ibanez t-shirt and a wonderful sounding Boss BF3 flanger effects pedal. I’ve already got the D1 distortion pedal. They are so nicely made and robust. And of course in the US somewhat cheaper than the UK. Yesterday (per the calendar but not me) I went in to the office to finish off a couple of things then I met up with two friends and had a great Indian lunch at a buffet place in Mountain View. I then said my goodbyes, gave hugs and kisses, and drove up to SFO and the start of my journey back to Yorkshire. SFO is very much referable to LAX. Its quieter and nicer to wait in. When I got to check in there was almost no one waiting. Frequent flyer miles mean I can use the business class queue and so I had rapidly checked in my case and confirmed I could carry the guitar on to the plane. Alas I could not upgrade my seat as I had a discounted ticket. Half an hour later I was through security and sat at the gate. As the client had bought the flight I was in cattle class at the back of the plane. This wasn’t too bad though because you learn tricks when you fly a lot. For example the back row in the centre is often empty so you can fold up the arms and lay out across all four seats. I always choose the isle seat of one of the rows of two seats where the plane narrows right at the back. This means that (a) you’re first in economy on the plane; and (b) you usually have the seats to your self and you have space next to the seats for storage. As they promised my guitar was stored in a storage cupboard on the plane. I like flying Virgin Atlantic. It was quick flight today. Under ten hours SFO to LHR. I read a bit (Manifesta – young women, feminism, and the future), watched Dexter on my iPhone, played some Final Fantasy IV on my DS, watched a couple of movies on the in-flight entertainment system, and slept. My case was checked right through to the final destination so at LHR I collected the guitar and walked and bused from Terminal 3 to Terminal 1 for my connecting flight, passing through passport control and security again. Half an hour later I was in the BMI business lounge. I was pretty tired by this point and the quietness of the lounge was just what I needed. Then it was on to the next flight. The domestic flight would not take the guitar on board so I had to get it tagged and they put it in the hold at the gate which has to be better than have it go through the whole baggage system. A quick flight and I was at LBA. A ten minute wait for my case and the guitar, which was brought through to me, and I was done. It was very very windy and cold. The landing was interesting and the wait for my ride back home freezing. Apparently its not that cold its just that I’ve gotten used to northern Californian climes. The guitar made it all the way back in perfect condition only for me to break a string whilst tuning it! I can has new guitar! Yesterday’s evening plans didn’t work out so I went to Guitar Centre to buy the guitar I promised myself I would buy when I came out here. On the last couple of visits I ended up sampling guitars in the store for some time on a couple of occasions. Unlike in the UK, where they seem very protective of their stock and sometimes won’t let you play something until you actually decide to buy it, the US has generally good customer service. You can just take a guitar down off of the wall, plug it in to nearby amp if necessary, and play. You never have to buy anything. You can even take it back if you decide you don’t want it or fancy something different. This means you could take something home just to try with your equipment for a full deposit. 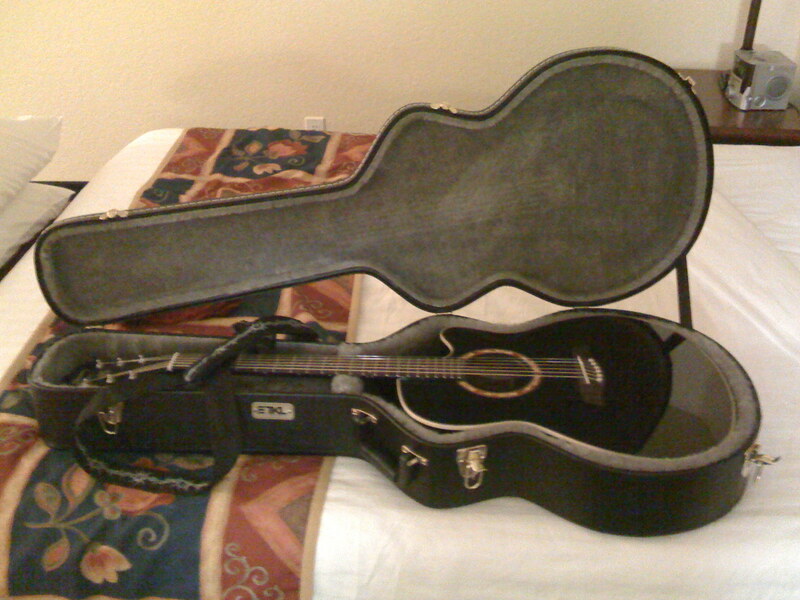 I bought myself a gorgeous black Ibanez AEF18 electro-accoustic together with a hard case so that I can get it home in one piece. And I got it at a great deal as the store is prepping up for Thanksgiving.